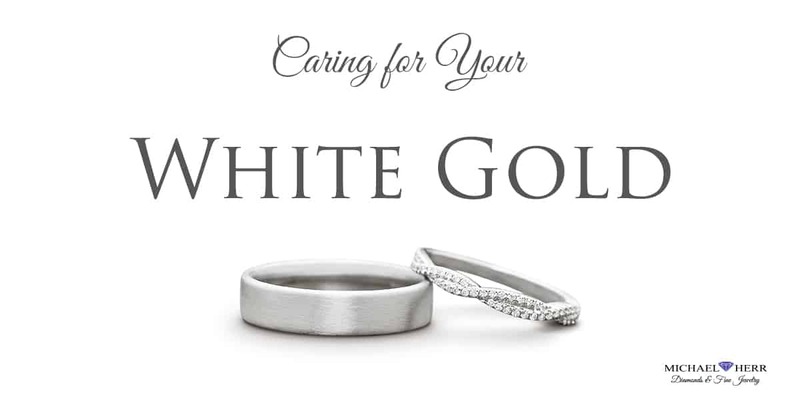 Home News Updates Jewelry Care Why Does White Gold Turn Yellow? And How Do I Keep it White? Why Does White Gold Turn Yellow? And How Do I Keep it White? Have you ever looked down at your hand and noticed that your ring or bracelet seems to be turning yellow? If you have white gold jewelry, this could be very confusing (and upsetting!) since you probably spent good money to have this quality of metal! Unfortunately, many people are unaware of how their jewelry works and some stores do a poor job of explaining the ins and outs of the metals. Customers often don’t know much about the jewelry they are buying and need to know how to take care of it. Many people choose white gold because it is durable, high quality, and won’t tarnish. They choose it over sterling silver for these reasons, but are upset when it seems to be changing colors. To make white gold stronger and give it its look, it is actually a combination of other metals, such as nickel, platinum, or palladium. To have the best white gold, you should get something that is between 10 and 18 karats. When creating different colored gold, jewelers add more or less of different metals to give it a “color” (pink, green, white.) To get the ring to be white, jewelers usually plate it with a white metal called rhodium. Why is it Turning Yellow? Natural acids and chemicals in your skin: This cause is just unavoidable! The oils in your skin will cause the parts of jewelry touching your skin to turn yellow quicker, like the inside of rings. Salt water, chlorine, soaps, detergents, and lotions: All of these will start to wear off the rhodium plating. Rubbing: The more your white gold is being rubbed, the faster it will turn yellow, which is why rings turn yellow quickly. Since the “yellowing” is just the rhodium plating wearing away, the simple way to fix it is to get the rhodium replaced. Take your white gold to the store you purchased it, and they will place a thin coat of rhodium over the gold, returning it to the shiny white color you had originally. If you want to take extra precautions, you can avoid letting your white gold get wet, soapy, or dirty when it’s easy. If you take it off before swimming and showering, the rhodium will fade slower. To summarize, your white gold ring isn’t really “white gold.” Jewelers use rhodium and other metals to give it the appearance that it is white. So after natural wear and tear of about a year, the yellow tint of the gold will start to show. Just bring it in to your jeweler and they should get it looking good as new!